Extrusion-wound tanks make for great aggressive chemical storage tanks. Sodium hypochlorite is a critical element used in the treatment of America’s water, but storing it can sometimes be a tricky business. Mark Cliburn of Guardian Equipment in Sanford, Florida, advises municipalities on the proper equipment to use in water treatment plants throughout the region. Mark discovered Houston PolyTank and their one-of-a-kind rigid-sided extrusion-wound plastic tanks a few years back and has been recommending them ever since as a sturdier, longer-lasting option. “We’ve done four projects over two municipalities where we’ve replaced roto-molded tanks with the Houston PolyTank extrusion-wound tanks. He spoke about one such project that included replacing multiple aggressive chemical storage tanks that were storing sodium hypochlorite. The roto-molded tanks had failed three times previously and the customer was finally ready to invest in a more longer-lasting tank solution. They were ready to invest in Houston PolyTank’s higher quality extrusion-wound tanks. 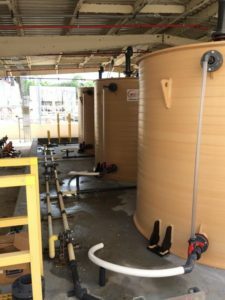 They purchased a series of these rigid-sided plastic tanks to hold the sodium hypochlorite (two at a wastewater treatment plant and two at a drinking water treatment facility).”We are expecting these tanks to last 20 years or more. Because of the rigid wall construction, these tanks can withstand demanding everyday use much more easily. Filling and emptying the tanks will not put the stress on these tanks that typically happens with the roto-molded tanks. Because of the stiff sides, you don’t see the bulging or ‘elephant feet’ that roto-molded tanks experience. Learn more about how Houston PolyTank extrusion-wound tanks are constructed. If you have a project that requires high quality tanks that don’t bulge when being filled or emptied, give one of our project engineers a call at 660-778-3393 or send us an email.